Widely read designer Dustin Curtis has come up with a new blogging platform called Svbtle, that’s meant to help you take blog posts from ideas to well-presented articles. At first, it looks like a better Tumblr, based on the work he showed off on Thursday. And in fact it looks so good that a couple developers had copied the design within hours, and offered new versions for the world to install. Which, in turn, sparked a big debate about the rights that creatives have over their work… I’m going to skip over all that because it’s not a new topic, and it misses the point. Curtis has a plan for this project that ties in the minimalistic admin and public interfaces of the platform with his larger goals as a writer, and possibly as an entrepreneur. He’s creating an exclusive blog network. He’s using his clout in design and startup circles to attract other thought leaders who blog, including Dom Leca of the beloved email client Sparrow, and John Collison of payment startup Stripe. The idea is that the design of the blogging platform should be a vital part of the creative process, that helps some of the best minds in the business refine and present their thoughts. The interface includes a section for brainstorming ideas, and an easy flow for turning them into posts. It removes the array of options, like advanced markup features that you’ll see on WordPress and other established platforms, to focus writers on core ideas. I got a bit more from Curtis about his plans on Thursday night, before his work got engulfed in a wide-ranging debate in the hacker community. Svbtle is an experiment. I wrote it for myself; it was only very recently that I decided to build it into more of a platform. My goal is to eventually open it to the public, but I want it to be really good before any kind of official release. Finding only the absolutely essential features that are required for something as complex as blogging takes a lot of work. For something like this, to paraphrase Antoine de Saint-Exupery, the design is finished not when there is nothing left to add, but when there is nothing left to take away. In the meantime, he’s following a proven strategy for seeding quality. Until I feel the design and workflows are good enough for a wide release, I’m working on building a private network of extremely well-vetted bloggers. I’m running it with more of a newspaper model than a blogging platform model; I plan to offer copy-editing and other benefits to help improve the writing of members on the Network, for example. This is key. Lots of professional blogs have little or no copyediting. 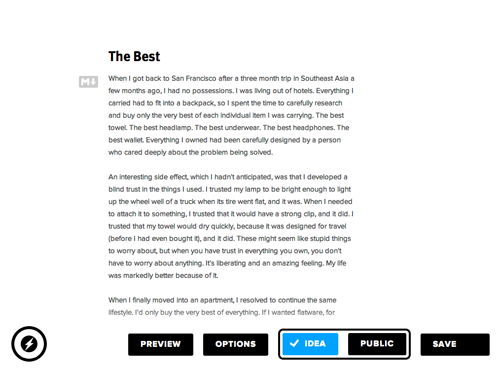 The network is intended to help writers polish the writing and reading experience, just like the design is. Because Svbtle is designed from a philosophy that focuses first and foremost on writing and the curation of ideas, and not on social features or personalization, I don’t see much of a chance of competing with Tumblr. I wouldn’t want to, anyway. They’re really good at what they do. So forget Tumblr. Curtis is trying to scale the type of brand experience that long-time bloggers like Jason Kottke and John Gruber have captured. 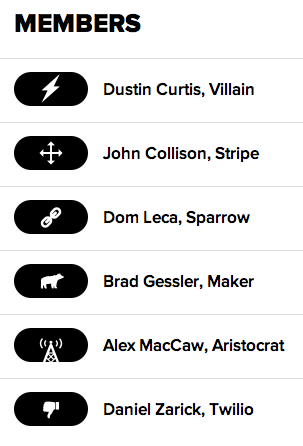 People who read Daring Fireball aren’t just on the site because they also love Apple stuff. They also identify with the the clean feel, the form-plus-function design principles that Apple embodies, that Gruber writes about. Innovation, as many of Curtis’ critics have been proclaiming, is about everybody taking a creator’s work and building on top of it. That’s exactly what Curtis is doing. He didn’t invent the first blog platform, and he isn’t building the first blog network that the world has seen. But he is taking the best elements of all the work that has come before, and building a new brand — the sort of thing that could prove quite defensible regardless of who scrapes the words or copies the design.